Dufftown 2000 Ltd would like to say a big thank you to all the Distilleries and Independent Bottlers for their support in sponsoring the Nosings & Tastings during the summer months of 2012. 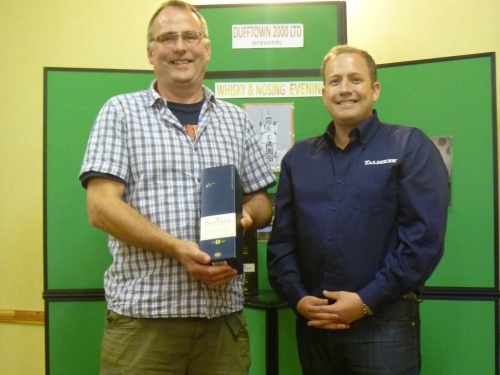 Steve Oliver from Dufftown 2000 Ltd. hosted our second nosing and tasting evening on behalf of Glen Rothes Distillery. He took the audience through a marvelous range which included Drumguish, Speyside 12yo, Speyside 1993 61.5%, North of Scotland and Inchmurrin 1997 55.3%. The nosing competiton was won by Roman Rusterhalz from Switzerland and Steve presented him with a nice bottle from their range. A very enjoyable evening and a big thanks to Steve. 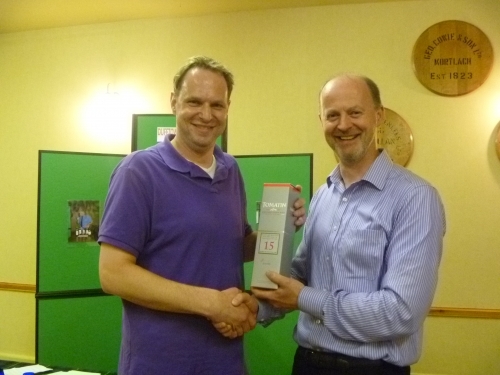 Again Steve Oliver stepped in to host the Speyside Distillery nosing and tasting evening. He introduced a wide range including which included Drumguish, Speyside 12yo, Speyside 1993 61.5%, North of Scotland and Inchmurrin 1997 55.3%. 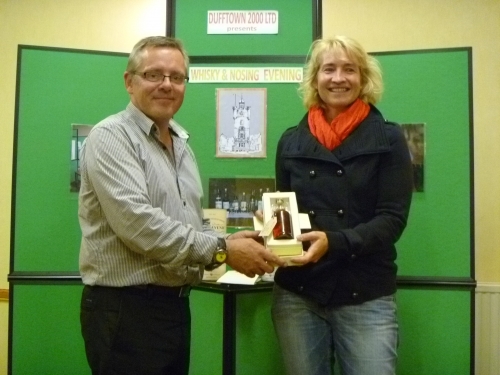 The winner of the nosing competition was Mette Beck from Denmark who was presented with a bottle by Steve. A splendid job Steve, many thanks. Kay Riddoch, representative from Duncan Taylor Scotch Whisky spoke about her Company and presented 5 great drams; the 12yo Black Bull, a Mortlach 46% 14yo from 1997 and bottlings from their new "Dimension Range", Clynelish 1990 21yo at 51.4%, Bunnahabhain 1989 22yo at 49.1% and the Single Grain Strathclyde 1980, 32yo at 54.2%. The winner of the Nosing Competition, after a "nose-off" was Ruben Hendrix from Belgium here being given a bottle of Black Bull by Kay. 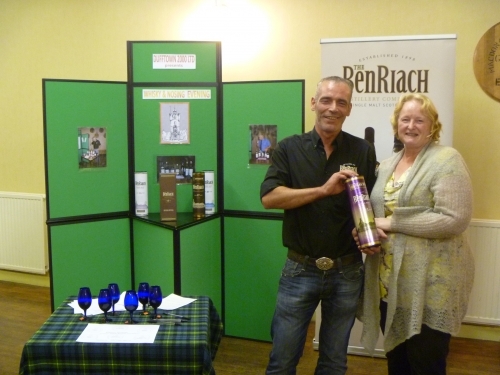 Stewart Buchannan, Global Ambassador of BenRiach Distillery surprised the audience with great drams from their core range. He brought along BenRiach 16 & 20yo, the 15yo Rum Wood, a peaty Curiositas and the new 17yo Septendecim & Solstice 17yo Port Wood. The visitors were amazed on how different barrels could create such great nosing & tasting notes. 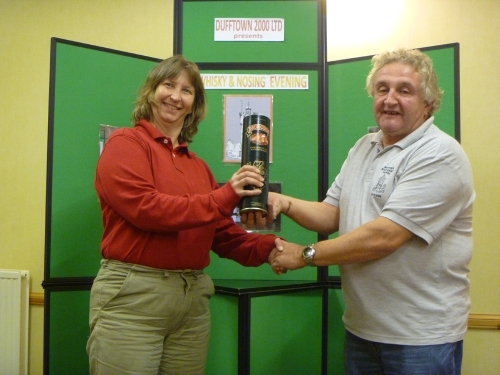 The winner with 6 correct drams was Dorothy Dixon from England seen here being given a bottle of 15yo Rum Wood by Stewart. Mike Patterson, Sales Executive of Gordon & MacPhail presented a selection of great whiskies to the near full capacity audience. He brought along a 1999 Balmenach, a GlenBurgie 10yo, a superb 15yo MacPhail,a delicious 21yo Speymalt Macallan 1990 and their own Benromach 10yo. Mike did a short speech about the owners of the company and the distillery after which we had a great tasting. 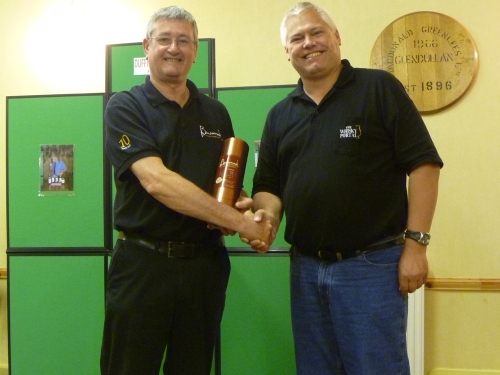 The winner of the nosing competition was Dennis Klindrup from Denmark who won a Benromach 10yo here being presented the bottle by Mike. Julian Holder Aberlour Distillery Visitor Centre Manager brought along a selection of bottlings from Chivas Bros. This included the very rare Sherry Cask bottling for the 200th Anniversary of Aberlour Village at 56.8% ABV cask strength. 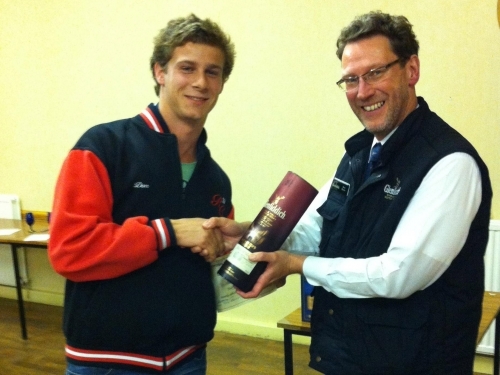 The winner of the competition received a bottle of Aberlour 18yo from Julian. The first nosing of the season got off to a great start with Gordon Haughton welcoming Bert Macor from Glenfiddich Distillery who gave an enthusiastic talk and tasting with some fantastic whiskies from the Glenfiddich range. 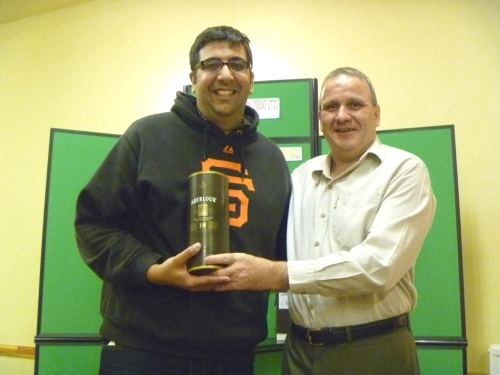 This was followed by the Nosing Competition which was won by Dominic Honner from Australia who was presented with a bottle of Glenfiddich Malt Masters Edition. Many thanks to Bert for a wonderful first night. Ren? Ramon welcomed Graham Eunson from Tomation Distillery who did our 3rd nosing and tasting evening of the season. He brought along some great whiskies from their range including Tomatin 12yo, 18yo, 15yo Tempranillo and two cask samples. A very enjoyable evening was had by all and finished with the nosing competition which was won by Arson from the Netherlands. Our appreciation to Graham for a great evening. 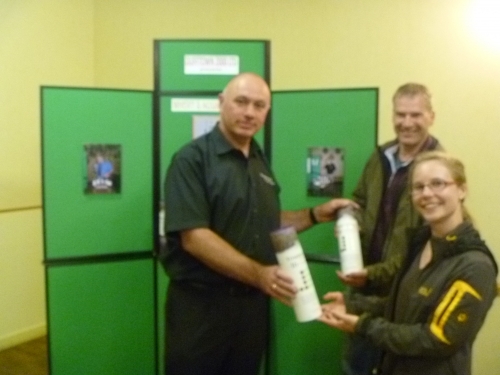 The Nosing & Tasting Evening on 18th July was sponsored by Tomintoul Distillery. Andrew Sim, Production Manager gave the audience a taste of what they call "the Gentle Dram". They brought along Tomintoul 10yo, 12yo Oloroso, 14yo Port Wood Finish, the magical 16yo and Old Ballantruan, the 50% peated malt. The winners of the nosing competition were Miriam Lenz from Germany & Harold Beers from the Netherlands here being given a bottle of 16yo Tomintoul by Andrew. David Sinclair made a special visit to Dufftown to present the crowd the Lagavulin 16 & Lagavulin Distillers Edition, Talisker 10yo & Distillers Edition and a Singleton of Dufftown. 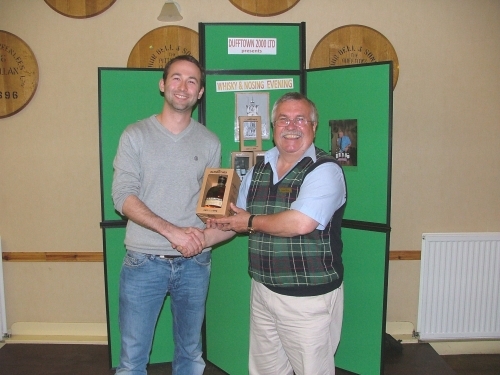 The drams were thoroughly enjoyed and the winner of the nosing competition was Steven Horton from England. David Sinclair & Diageo was thanked for a great evening of entertainment. David Mair, Brand Ambassador of The Balvenie Distillery brought along a great selection of drams for this evening. The Balvenie Doublewood, Single Barrel, 21yo Port Wood and cask strength Tun 1401 Batch 2 & Batch 5. The audience enjoyed the information David gave as well as the drams. The winner of the nosing competition was Heike from Germany who only had her first dram of malt whisky last week which was coincidently also a Balvenie ! She nosed all 5 drams correctly!! Iain Allen Visitors Centre Manager from Glen Moray brought along a great selection of Single Malts and a 2yo peated spirit. The 25yo Port Wood finish was the favourite of the evening along with the cask strength Chenin Blanc. 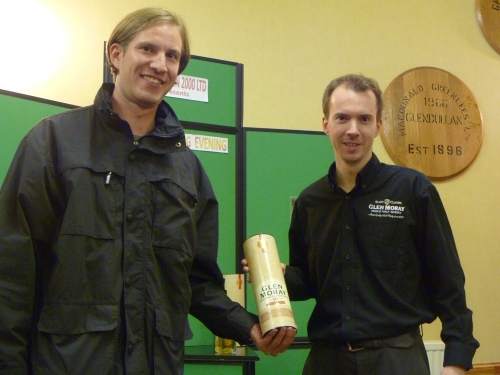 The winner of the nosing competition was Daniel Vogler from Germany seen here receiving a bottle of Glen Moray 10yo from Iain. 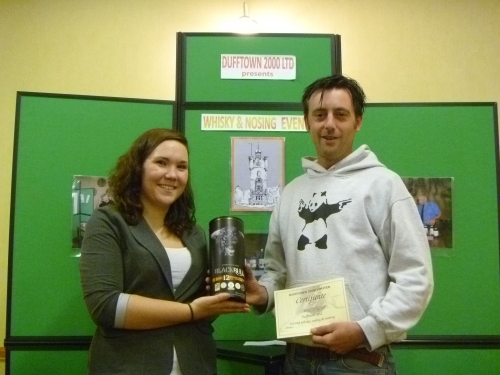 Dufftown 2000 Ltd. organised the last Nosing & Tasting of 2012 which was well supported by 25 people from around the world. Our dram selection was Singleton of Dufftown 12yo, Tomintoul 12yo Oloroso, Glenfiddich Malt Masters Edition, Glen Rothes Select Reserve, BenRiach 10yo Curiositas and Lagavulin 16yo. Gordon Haughton, Treasurer of our Charity Organisation presented the winner Susan Hopler from the USA with a bottle of Speyside Malt. He thanked all the distilleries and Independent bottlers for their continuing support of Dufftown 2000 Ltd. in providing not only their product but also their time for coming to Dufftown, knowing that all the money we gather will go into the new Whisky & Heritage Centre.